Why does it say right in the title that this booklet’s topic is at the origin of Adidam? 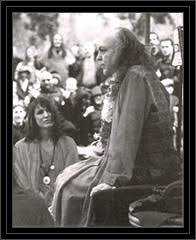 Avatar Adi Da’s Instruction on "Dual Sensitivity" is critically important and must be understood and addressed by any serious student or devotee of His. Because people don’t want to live in fear, they individually and collectively desensitize themselves (seeking by every kind of worldly and religious means) to the fact that everyone suffers and dies. The acknowledgment of our mortal condition is the first sensitivity. The second sensitivity is to the impulse that everyone has to be completely and permanently happy. 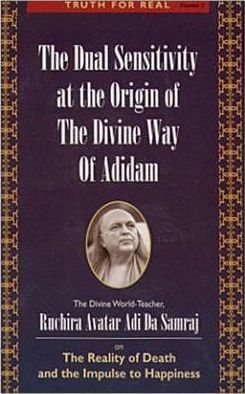 Although the basic facts of this Teaching Argument (comprising the first part of the booklet) may seem obvious, Adi Da Samraj Brightens all the dark corners so thoroughly and exposes all humankind’s loopholes so explicitly, reading this short Work can leave one with a jaw-dropping, “why did that not occur to me?” feeling. In the closing section of the booklet, Avatar Adi Da Reveals how True Happiness and freedom from the cycle of death and rebirth can be realized through devotional relationship to Him, which is the Way of Adidam. You (at heart, and fully) want Happiness, although (in some sense) you would rather not even confess that Happiness is what you truly want—because you feel that the real attainment of Happiness is not even possible. Nevertheless, truly and always, this is what you want: Unalloyed, Unchanging, Absolute Happiness. The "problem", simply stated, is that you are not any good at "getting" It! And you do not "Know" What True Happiness Really Is. Therefore, you are in the same situation that the rest of ordinary humanity has been in all along. From the Discourse, The Only Complete Way To Realize The Unbroken Light of Real God (excerpted for this booklet). The importance of the Teaching argument presented here cannot be overstated and to have it in this booklet form is a real blessing. It can be read in one brief sitting by beginners or kept nearby as a reference by those advancing in practice.